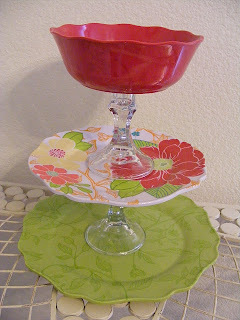 Today I'm going to highlight a few of my favorite projects from the linky party that I had a couple of days ago! There were so many WONDERFUL ideas and it was super hard to choose some to highlight. If you haven't browsed through the cool projects that cost <$10 and only take 20-30 mins to complete, here's the link to Tuesday's party! I really loved this idea. It couldn't be easier and the possibilities are endless! The 3 tiered tray over at Bacon Time with The Hungry Hypo is so cute and anyone could do it! Check it out! 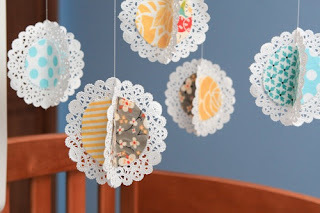 The hanging fabric doilies by Lemon Tree Creations are so cute. 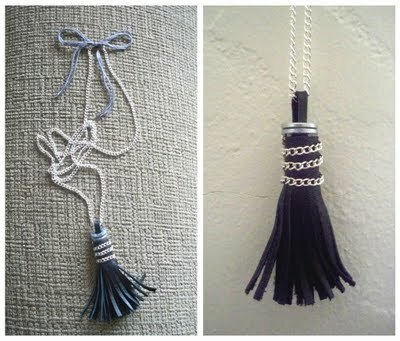 I'm thinking party decor, fun spring window treatment... She uses them in her baby's room. Finally, I loved what Erika over at Bliss Images and Beyond did with her picture frames! 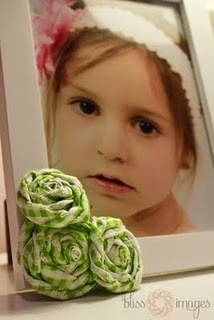 She added three simple rosettes to her frame to give it such a sweet look. Great idea and I'm certainly going to be doing this sometime soon! Have a marvelous day today! Yikes. I just counted and used more than ten exclamation points. I do declare! Thank you for featuring me. I will proudly grab my button now. What wonderfully creative projects! I'm particularly smitten with those whimsical hanging doilies! Hi it's Katie from Little Katie on the Prairie - I am a new follower and facebook follower and I WILL be participating regularly in your link parties! It was great to leave off the gloves today. I actually felt almost HOT! Hard to believe. I'll have to join the next linky party. Your followers list is growing like crazy! Looking to do a craft with the girls on Mother's Day and you've given me so much to think about!!! Can't wait!!!! PS....Loved Ethan's remark today! He's a RIOT!!! What a lovely roundup!! Thanks for featuring my hanging doilies, they are so fun. :) Glad you like them. Have a great weekend! !